Another beautiful summer sunset as seen from the cottage patio. 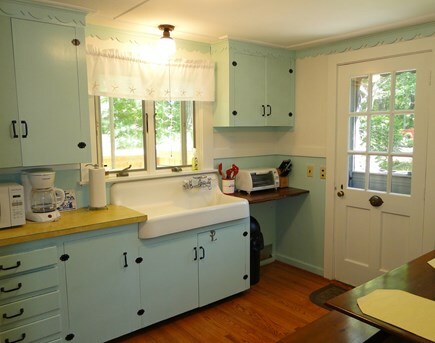 Vacation in an authentic 1930’s Cape cottage! This cottage is located on the shore of Town Cove in Orleans in a quiet residential neighborhood, about 1 mile from the center of Orleans. 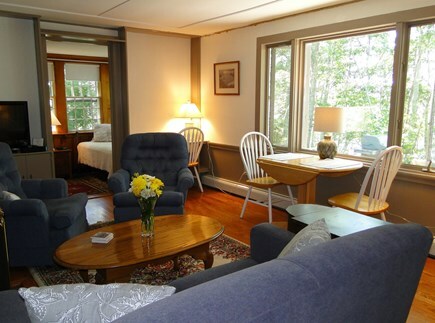 It was built in 1938 and has just been restored and updated with 21st Century comforts, including wi-fi. 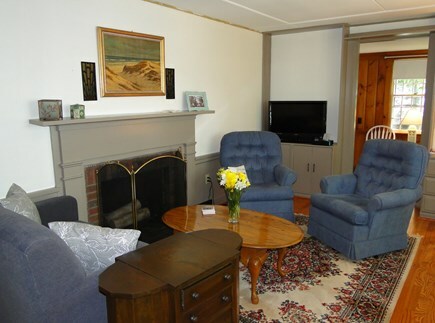 The cottage is clean, comfortable and quiet. It’s perfect for a couple’s get-away. 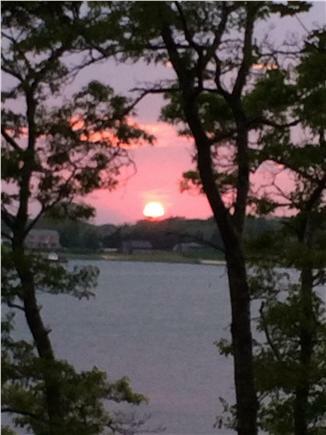 Enjoy your evening meal outside on the patio watching the beautiful sunset across the Cove. Beach your kayak or canoe right on the shore in front of the house. 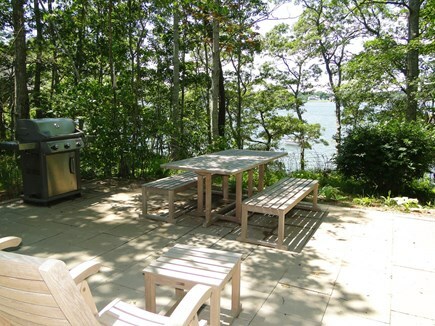 There is direct access to the shore of the Cove from the cottage. The calm water of the Town Cove is just right for kayaks, canoes or SUP boards. You can even embark on a daylong adventure and paddle out to Nauset Marsh or Nauset Beach. Don’t forget to pack a picnic lunch! 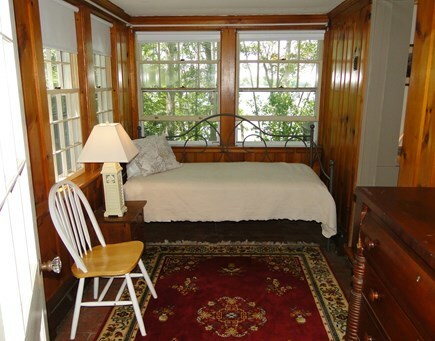 This is a one bedroom cottage with brand new wood floors throughout. Plenty of room for two people or a couple with a small child. 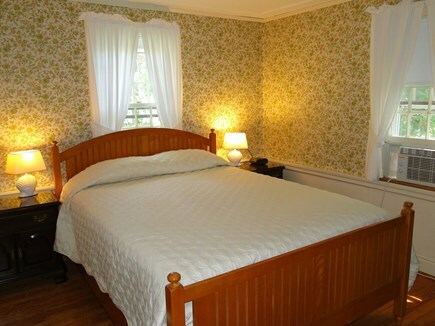 There is a queen size bed in the air conditioned master bedroom and a twin sized day-bed in the adjoining sun room. 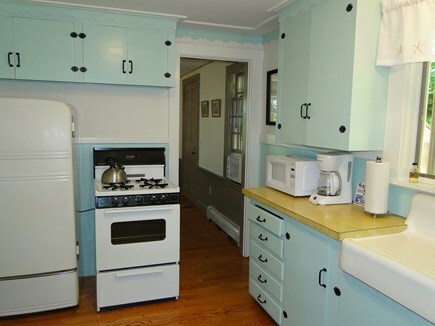 The kitchen is fully equipped for cooking with a gas stove, original cast iron sink and a vintage 1950’s fridge. 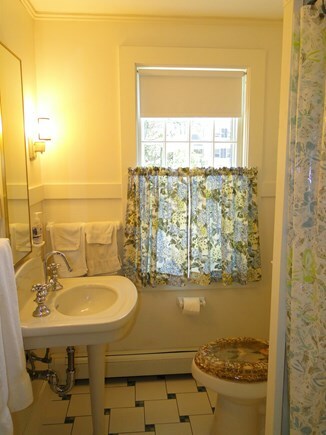 There is a full bath with shower as well as a fully enclosed outdoor shower. The washer and dryer are conveniently located in the basement. The large, bright living room, which overlooks the Cove, has a new flat screen TV and a lovely view of the sunset. Unbelievable Nauset Beach, with its glistening soft sand and crashing waves, is a short 3 mile drive from the cottage. Would you rather visit the peaceful Bay? 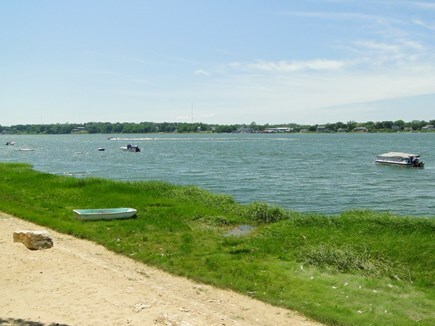 Skaket Beach is only 3.5 miles away with its warm calm water and endless tidal flats. Perfect for small children! Whether you want to explore nature by biking or walking, dine at one of Orleans great restaurants or shop in one of its unique stores, or do it all - this is a wonderful place to begin. Come be our weekly renters, and see why Orleans founding fathers (and mothers) made this road their home. Anyone can stay in an ordinary home - you have the chance to stay in an extraordinary home! Seize the summer day! All rooms are on one floor, two steps into house. Not wheelchair accessible. This place is perfect for 2-3 people. We have stayed here for the last two years. We love the central location and quiet street, not to mention the beautiful sunsets! Love that the Ice Cream Cafe is only minutes away! Coast Guard Beach is always a favorite of ours, not much of a distance away! We are so glad you enjoy staying at the cottage. And the Ice Cream Cafe is one of our favorites, too! Truly enjoyed the house and location close to beaches and shops. I spent a week with my dog, and felt welcome and at home. 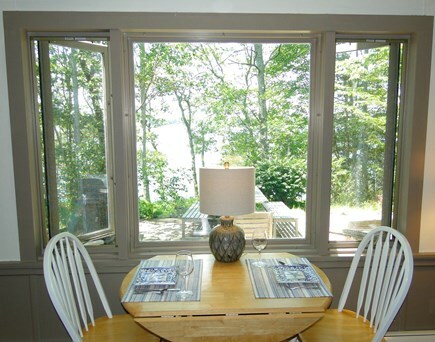 The house is nicely located, well furnished and has great views of the town cove. The outside shower was used everyday and wonderful to have. The patio was perfect with its quality furnishings for cooking and relaxing with a cocktail. The owners were very accommodating to work with as I had to make some changes to my reservation. Thank you, Martine! We are very happy to hear you had an enjoyable week in the cottage. We hope you'll come back again for another visit! We enjoyed our week at the cottage. It was very clean, centrally located to restaurants and beach and right on the Town Cove. Seeing the water and sunsets was relaxing. We ate most of our dinners and enjoyed cocktails on the patio with the views of the cove. Our favorite was the outdoor shower...so nice. Enjoyed the day bed. Reading a book with the breeze blowing in was perfect. Would give this vacation cottage high ratings!!! Thanks, Debra! We are so glad you had a great vacation! This lovely home, located on the Orleans Town Cove, was the perfect destination for a long weekend! 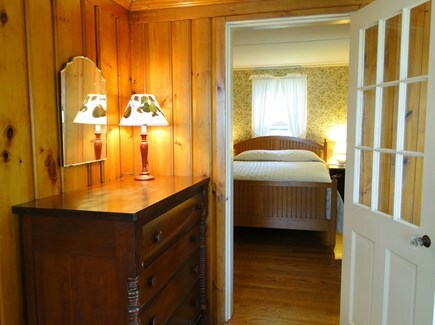 Light filled rooms, comfortable furnishings and a quiet street made for an enjoyable stay! Orleans Center, with its shops and restaurants, is only a short car ride away! We can’t wait to return! We're happy to hear you had a wonderful weekend! Thanks for your nice review. We look forward to seeing you again! 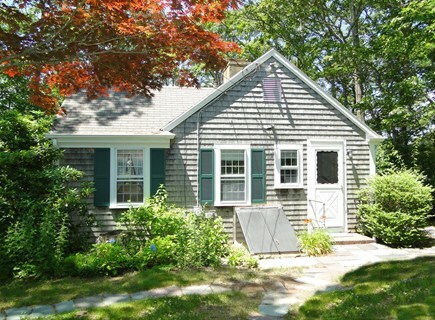 This is a lovely cottage for 2-3 people. Great hardwood floors, charming. Clean. Great patio overlooking the water. Close to everything. Central location in Orleans. We are so glad you enjoyed your stay at our cottage. Thank you for your review! We hope you will come back and visit again! This is a great spot for two or three people. Classic look but updated and fresh, no old mustiness. It felt bigger than it looked with a very nice patio. Tranquility on a quiet side road but close to beaches, bars and restaurants. 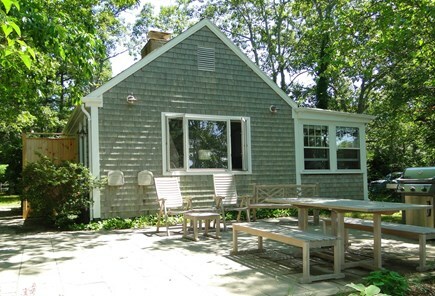 After 30 years of vacationing on the Cape, I can tell you if this is your first time, the location in Orleans is probably where you want to stay. It was a pleasure to meet you and we're so glad you enjoyed the cottage. The weather for your week wasn't too bad! Thank you for your nice review. We look forward to seeing you again! We are so glad you enjoyed your stay at the cottage! It sounds as though you hit a lot of the fun spots in the area. We love the Corner Store too! It was a pleasure to meet you and we hope you'll come back again. Very pleasant stay. Nice cottage and location....everything was perfect! We enjoyed our stay at your cottage. It's perfect for a couple.